P.J. 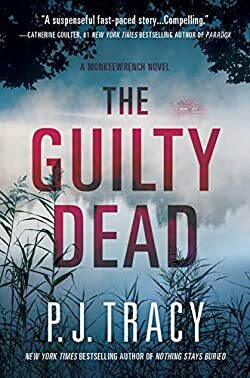 Tracy is the mother and daughter writing team best known for their Monkeywrench thriller series. The mother, Patricia Lambrecht (aka P.J. ), had her first story written and published when her daughter, Tracy, was 8 years old. Over the years she has been working as a freelancer writing short stories, magazine articles as well as romance novels while raising her daughter. She dropped out of college to pursue her career in writing. Tracy Lambrecht loves horses and has spent many hours during her childhood riding and showing horses. She attended the St. Olaf College in Northfield, Minnesota where she graduated from with a degree in Russian studies. She also studied voice at the same college, later becoming for a while an opera singer. One of her passions was traveling and singing in rock bands all over the place, so she started to write in order to finance above-said hobbies. As time went by, she soon realized that what she really wanted to do was writing above all, much to her mom’s delight, who took no time in pulling her into the new family business, that of writing successful thriller books together. It was a very natural progression considering the fact that both mother and daughter loved writing since their childhoods. Initially the mother-daughter duo collaborated on various short stories, also wrote romance novels in order to finance their expenses, under several different pseudonyms, including PJ Platz, PJ Lambrecht, Mariah Kent, Melinda Cross and Jessica McBain. Once they realized that they’d prefer writing books in the genre they also love reading most – thrillers, the game was on, and Monkeewrench was born. Their first book in the Monkeewrench series is called – Monkeewrench, aka Want To Play?. It was also the book that hooked me on this series right away. People being murdered and there is a connection to a computer game? Sounds right up my alley! Monkeewrench started out as a standalone novel, however at the encouragement and enthusiasm of the publishers, the author duo continued to write, and today we are sitting in front of 6 books, with a 7th one coming out later this year, in August. Here are the P.J. Tracy books in order for their popular Monkeewrench series. I will not list here the romance novels written under other pseudonyms, since that genre goes beyond the scope of this page.